Night swimming and dining around your beautiful outdoor pool area will be enhanced when you use any or all of these unique pool lighting ideas. Now that you’re preparing your landscaping for warm spring weather, it’s a good idea to start thinking about the summer as well. With only a few months until summer and Maryland’s famously unpredictable weather, why not get to work on the pool lighting you’ve always wanted? Night swimming and dining around your beautiful outdoor pool area will be enhanced when you use any or all of these unique pool lighting ideas. There is a reason why LED lighting has become so popular in recent years. Whether your pool is older or brand new, underwater LED lights can add the fresh, bright lighting your pool needs. Swimming at night without proper lighting can feel a bit dangerous when you can’t see what’s around you. Stay safe and feel secure with LED pool lights mounted around the inside of your pool. These lights come with dimmable options, as well as multi-color options. Lights can flash rather quickly or slowly to add another element to your summer pool parties. The best way to go about adding beautiful underwater lights to your pool is by contacting a trusted pool lighting expert in your area. Lighting around the pool is another important aspect to take into account, especially when it comes to safety. Make sure that the pool deck and walkways are well lit without being too harsh or bright. 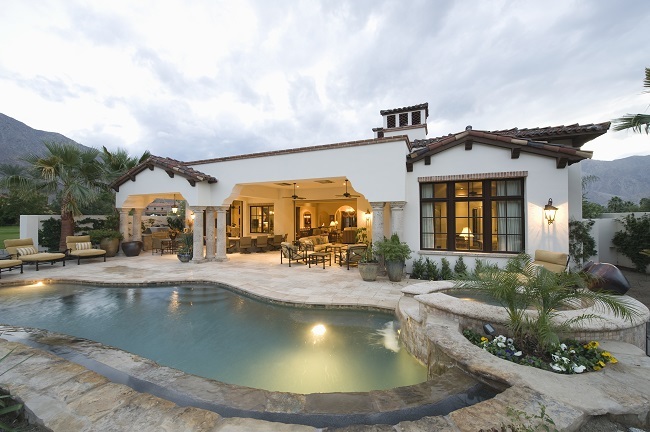 Subtle lighting around landscaping elements will not only give your pool area the elegant, moody lighting it needs, but it will keep you, your family, and guests safe as well. Solar lighting is another emerging lighting trend in 2018. With stylish and trendy lighting fixtures, solar lights can easily be incorporated anywhere around your pool area. Not only will they keep your pool landscaping looking bright and on-trend, but solar lights will also save you a lot of money on your energy bills. They are ideal for filling in small gaps or spaces that need any additional light around your pool at nighttime. This entry was posted on Friday, March 30th, 2018	at 9:51 am	. You can follow any responses to this entry through the RSS 2.0	feed. Both comments and pings are currently closed.